The Redemptorists » Second Sunday of Lent: Stop talking already! In today’s world it’s very difficult to empty our minds of the noise and listen in quiet to the voice of Jesus. I remember when I was a teacher it was always difficult to tell a student to be quiet because nobody likes to be told to stop talking. But sometimes we can miss the most important lesson if we keep running our mouths. As a teacher I always tried to instill in my students the importance of being quiet especially when someone was explaining something. But sometimes I had to ask them to please be quiet, to stop talking already! It’s a bit disconcerting, even more so when it’s said by someone who is very important. And it’s most disconcerting when the command comes from God. That’s what happened to Peter in this Sunday’s Gospel. Peter saw Our Lord being transfigured: the face of Jesus shone like the sun and His clothes became as white as the light. Suddenly, Moses and Elijah appeared. They were talking with Jesus. It’s here that the whole event became a little too much for Peter. He started babbling. He just couldn’t keep quiet and watch, so he started to blabber. Then God spoke through the cloud, “This is my Son, the Beloved; he enjoys my favor. Listen to Him.” Not a peep came out of Peter’s mouth. He and the other two disciples were lying on the ground pretending that they weren’t there, until Jesus touched them and told them, “Do not be afraid.” When they raised their eyes, they saw only Jesus. This “do not be afraid” conveys a feeling of peace and quiet, of calm following a traumatic experience. There is also a moment of intimacy, of serenity, of nearness to God. Peace, calm and quiet are things we all long for, but too often we don’t experience them. There is too much noise about us. There is too much noise in our minds, deafening us, stopping us from thinking, from reflecting. How much we admire the wise person, the person with inner peace and calm. All too often we are like Peter, our minds filled with noise and when anything important happens, we start chattering. It’s important, then, to place ourselves in God’s presence and empty our minds of all the distractions. There are so many voices speaking to us; people telling us to follow them and not Christ. People who think they are on to a good thing and make it sound so much better, so much more exciting and enjoyable than listening to the voice of our “old” God. It’s the same old story — the story of the Old Testament, the people of God listening to other voices. God continued to remain faithful, even while they put Him out of their minds. Again and again, He declares His faithfulness and calls His people back. Now, in Jesus, He calls us. So, we have to be quiet. Often. Every day if possible. We have to listen to God. We have to listen to Jesus who tells us not to be afraid, but to possess our souls in peace. The transfiguration episode gives us strength for our daily lives and ministries and enables us to walk in the light of Christ. Elton is a third-year theology student at Boston College. 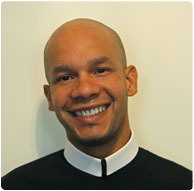 A native of the Caribbean nation of Dominica, he professed vows as a Redemptorist in 2009.